We love wine more than anything but, traveling comes in a close second, so traveling with wine is nearly perfect. And that’s why we reviewed these wine travel bags which are also great bags for air travel with wine. It presents some challenges depending on how far you’re traveling and whether you need to keep the wine chilled in transit. Wine travel bags with insulated interiors solve part of the problem, but they vary in quality. Wine bags are also available in a variety of styles, so you need a carrier that reflects your taste as well as the formality of the event. Here we share ten of the best wine travel bags. Whether you’re carrying wine for a picnic on the beach, a train ride through Napa Valley, or a plane trip across the Atlantic, we have the perfect options for you. This insulated wine tote from OPUX is perfect for an afternoon picnic. The wine compartment is insulated to keep the bottles cool and has a divider to protect them from clinking together. It has convenient dual zippers, plus a front pocket for carrying other accessories. For a wine tote under $20, we’re impressed with its durability. It has a handle at the top, plus a detachable shoulder strap, offering a few transit options. We also love that it’s available in so many colors. For the price point, you can easily pick up a few of these to match the mood of the occasion. As a bonus, it comes with a free corkscrew. Top quality deluxe insulated wine tote to keep wine or champagne at the perfect temperature. This kit from Picnic at Ascot is an even more complete picnic kit. It includes two acrylic wine glasses, a wine opener, and a pair of napkins. With the goblets in place it holds just one bottle of wine. Remove the goblets and you can carry two bottles. The panel that holds your wine opener folds neatly between them so they won’t collide. The tote is made of sturdy canvas and comes in a variety of colors and patterns. Although it’s and extremely durable carrier, we love that it comes with a lifetime guarantee from the company. KOVOT boasts one of the most complete picnic kits on the market, including accessories you might not have thought about. It includes an insulated compartment to hold two bottles of wine with a divider in between. The side pocket holds two acrylic wine glasses, cloth napkins, a corkscrew, and a bottle stopper. The surprise accessory is a pair of stakes so you can secure your wine glasses on uneven ground. At first blush, this might seem like overkill, but it’s perfect if you need to set your glass down on the beach. This picnic set would make a wonderful impression on a first date and also makes a marvelous gift for any wine lover. 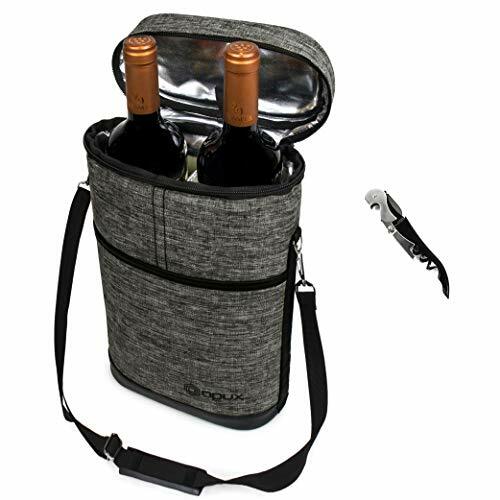 GREAT FOR TRAVEL - Well-made and sturdy leather handles and adjustable shoulder strap with stainless steel buckle of this wine tote help you carry your wine to anywhere. 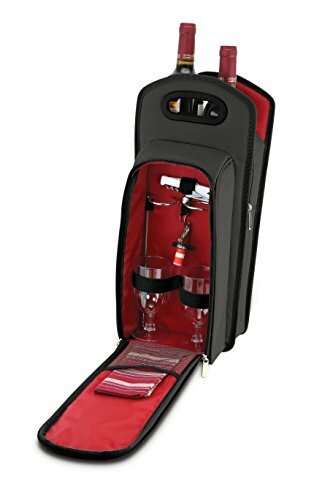 Great for transporting wine to parties, wine dinners, restaurants, pool or beach parties, picnics, concerts and sporting events. Come with a free corkscrew, facilitate you open your bottle of wine easily. If you want a 2-bottle carrier that looks more like a regular tote, Kato makes this stylish wine bag. It keeps wine chilled for hours thanks to its internal padding and insulation, plus it has a flexible divider to protect the bottles in transit. We love the zippered side compartment for carrying your phone, keys, or wine accessories. Like some of the other kits, it also comes with a free corkscrew. Above all, we love the variety of colors and patterns available, making this one of the most versatile and stylish totes at this price point. TEMPERATURE CONTROL - Thermal shield insulation with interior divider, keep 3 wine bottles separate at cold for hours, thick padding prevent wine bottles from clinking or shattering. The Vina is our favorite 3-bottle wine tote. The bottles are held in place by dividers and the insulation does well in keeping chilled bottles cool until you get to your destination. One thing we especially love is how easy this carrier is to clean. The high-quality polyester is just a wipe down from looking perfect again, making it the ideal carrier for picnics, festivals, and other outdoor events. 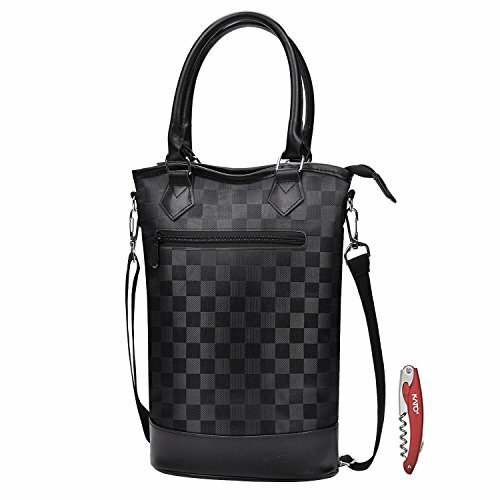 It has a convenient side pocket for storing the free corkscrew and any other items you need handy. 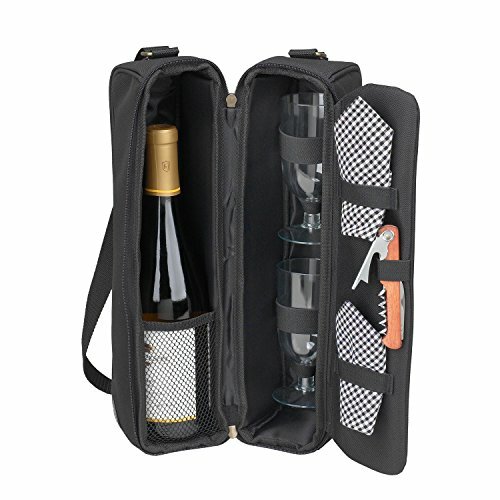 PORTABLE DESIGN - Sturdy handle and adjustable shoulder strap with stainless steel buckle of this wine carrier help you carry your wine to anywhere. 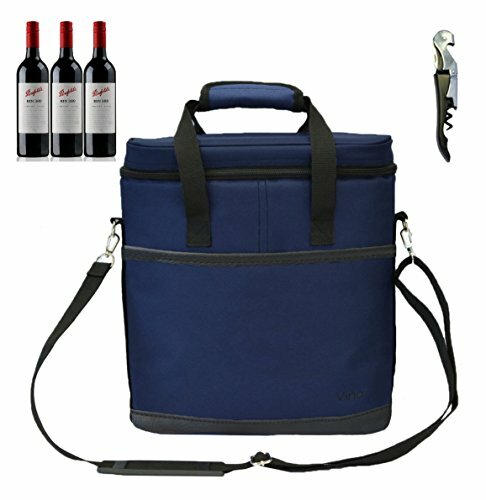 Great for transporting wine to parties, wine dinners, restaurants, pool or beach parties, picnics, concerts and sporting events. We love the styling of this 4-bottle carrier from Kato, with its leather accents and stainless steel hardware. The tote is made of canvas and comes in gray or a cute navy and white striped pattern. It doesn’t have side pockets, but we love that the divider inside is removable, which gives some storage flexibility. For such a stylish bag, we love the affordability. The quality of insulation is also impressive, keeping chilled wines cold for hours. 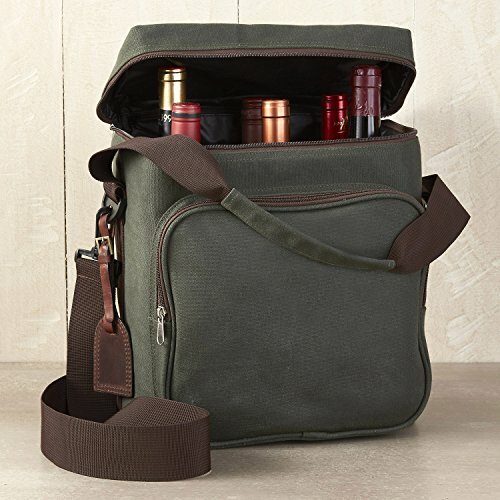 CLASSIC DESIGN - Sleek and sophisticated, the 6-Bottle Waxed Canvas Weekend Wine Bag by Wine Enthusiast features a stylish forest green finish, chocolate brown trim, and a monogrammed leather hang tag. For higher-capacity totes, sturdy construction becomes critical. If the carrier isn’t built to handle the weight of the bottles, it will wear out quickly. Worse, it might break while you’re carrying it. 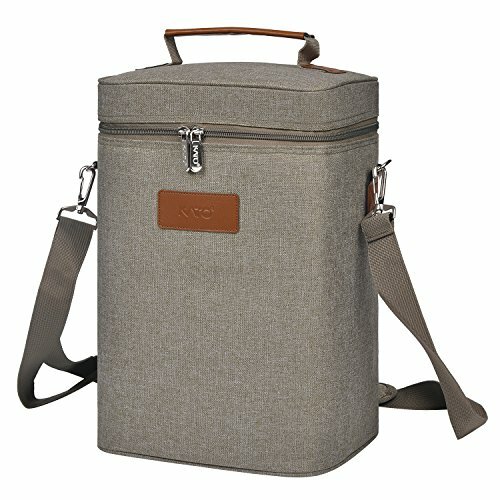 For transporting up to 6-bottles, our favorite is this canvas wine carrier from Wine Enthusiast. It has a padded divider which leaves space to carry up to six Bordeaux bottles, plus a side pocket for accessories. The insulation and padding are both excellent and the exterior construction is just as impressive. The forest green canvas is durable and we love the chocolate brown trim. There’s also a monogrammable leather hang tag in case you’d like to personalize it. 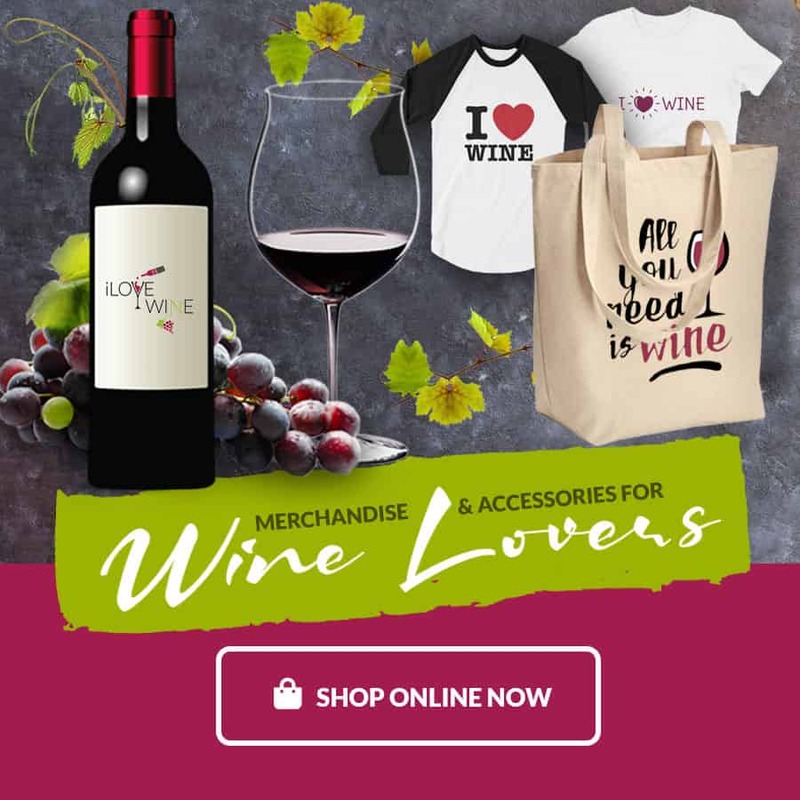 PREMIUM 100% LEATHER WINE BAG is the ultimate wine carrier for taking your best bottles of wine to friends, restaurants, parties, or bringing them home from the store. This handsome classic leather bag shouts class. this gorgeous leather weekend bag. It’s much more expensive than a simple canvas carrier, but you won’t find a classier wine travel bag. It’s 100% handcrafted and the attention to detail is apparent in all aspects of the bag, both inside and out. It holds up to six bottles upright, separated with padded dividers, and has an outer pocket for small accessories. 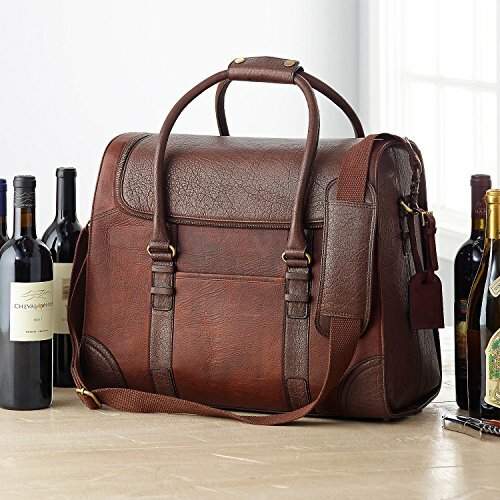 It’s the perfect bag to accompany you on that train trip through wine country you’ve always dreamt of. USA DESIGNED by a pilot, ideal for travellers or as a gift! Planning a longer journey? 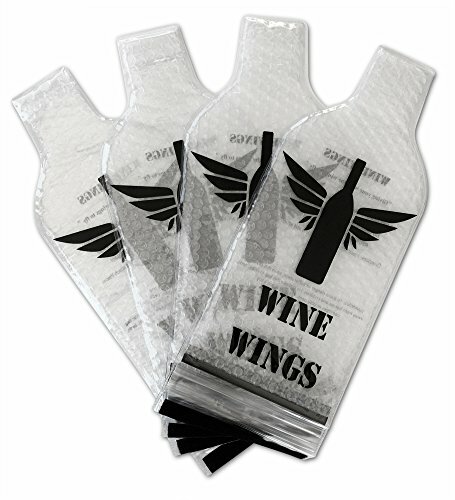 If you’re traveling by plane, Wine Wings are an inexpensive way to safely pack your wine. These bags completely seal the wine bottle inside with Ziplocks and velcro to keep any leaks contained. The bags are also padded internally with bubble-wrap and have a stronger exterior to prevent piercing by other items in your bag. They’re durable and reusable, so investing in these means your only worry will be keeping your suitcase under the weight limit. Finally planning that wine vacation through Europe and plan to bring a lot of bottles home? VinGardeValise makes suitcases specifically designed to keep your wine safe during its journey. This suitcase holds 12 bottles and weighs between 43 and 49 lbs when filled to capacity. This keeps it safely under the checked bag weight limit for most airlines, though be sure to doublecheck when you buy your tickets. The suitcase meets TSA, FAA, and airline luggage standards and is a sturdy piece of luggage, as well. It has double channel zippers, a reinforced internal frame, and wheels that spin 360 degrees for easy mobility. We also love that it has a TSA-compliant lock to keep the wine even more secure. 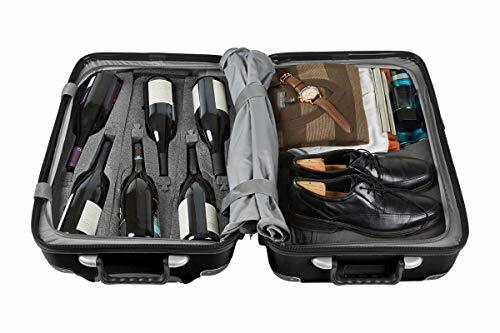 You may also be interest in getting your a wine case for traveling. You can check out our recommendations for best wine case here.